Posted by Eddie & filed under Military/Aircraft, Mountains & hills, August 14 2009. Last Sunday I travelled to the Cairngorms for a walk to Braeriach. I walked from Whitewell in the Rothiemurchus Forest through the Lairig Ghru. 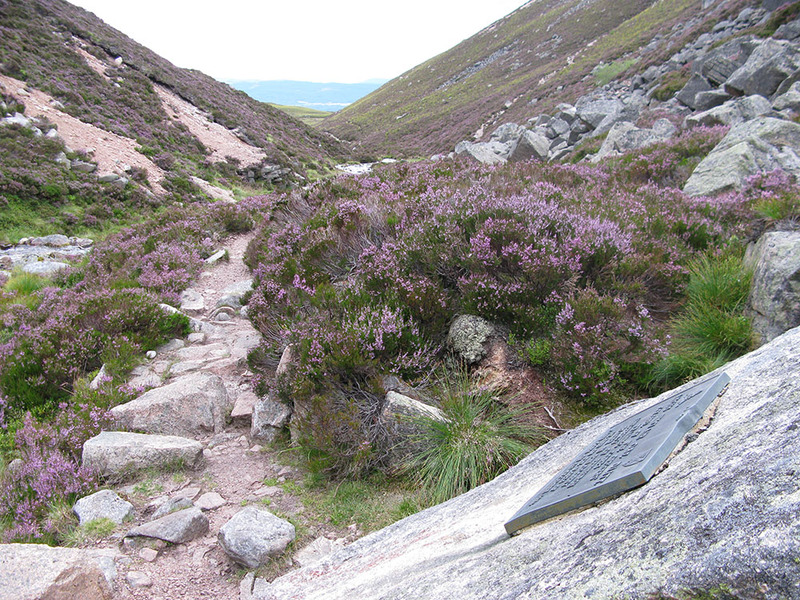 I stopped near the entrance to the Lairig Ghru at a memorial to Angus Sinclair who died in the Cairngorms in 1954 and who was the CO of the Edinburgh OTC at the time (see a photo of the memorial here and of the plaque inscription here). 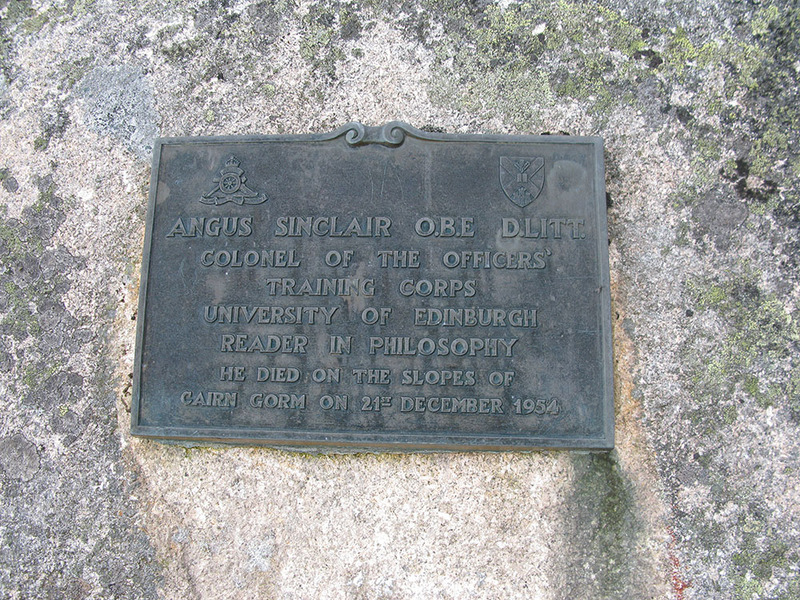 There used to be a mountain hut near this memorial named after this man, which I visited in April 1990 as part of an Edinburgh OTC group, not long before the hut was demolished. It used be positioned above the river on a small flat area at OS 10-figure grid ref. NH 95869 03637. From there I walked over the summit of Sròn na Lairige (almost stepping on a shrew on the path) to camp on a nearby col. It was a high camp (about 1150m) and unfortunately as I was setting up the tent the weather worsened dramatically and heavy rain started which did not stop for another 10 hours through the night. So I had yet another soggy night, but it was a good test of my tent which didn’t let me down. In the morning the rain had stopped but the cloudbase was still lower than my campsite and it was grey and gloomy. I walked to the nearby summit of Braeriach and also looked for remains of two aircraft that crashed near the summit in the Second World War. 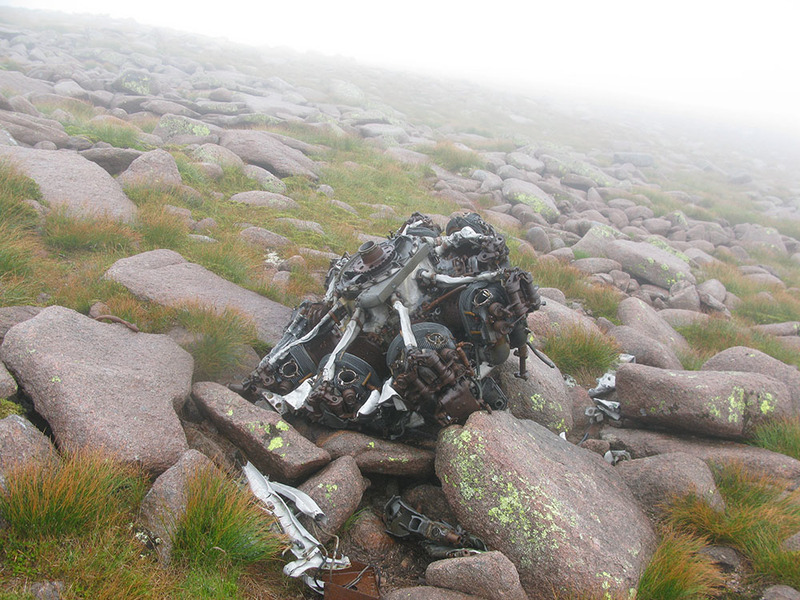 It seems incredible, but a RAF Airspeed Oxford and a RAF Bristol Blenheim bomber crashed on almost exactly the same spot near the high summit plateau of Braeriach in the Cairngorms, less than 18 months apart. You can see the photographs I took of the wreck sites on my website here. Panel observed 1957[?] on crash site. Alloy 8 inchs. square, almost. Dark grey paint one side. 2 `nics`one end opposite sides about 1.5 inches from one end. Pressed groove between nics about 6inchs. long to inside of panel. Marks include`FB 53411-2`, circle with `C&B 112`, `S`, and tiny circle with possible number `153`. Which of the aircraft was this from and what was its purpose? Any suggestions? It’s a bit difficult to say anything for certain about the wreckage you saw without knowing what the location was – if it was on the main route to the summit of Braeriach from the Lairig Ghru then the section of wreckage you saw was in all probability from the Oxford, but it may well have come from the Blenheim, the two debris fields essentialy overlap at this point. And you saw it in 1957! That was some time ago, only 12 and 14 years after the crashes – there was probably a lot more wreckage about then, which in the years since has been depleted by walkers taking parts away (although a surprisingly large amount still remains from the two wrecks). I don’t suppose you have any photos of what you saw?